There are plenty of new features in store in the 2019 Honda Fit to help it remain a top performer and popular choice in the subcompact car segment. First is the addition of Honda Sensing® to the Fit lineup. This suite of advanced driver-assist features like Adaptive Cruise Control and Collision Mitigation Braking System is a rarity in the affordable subcompact car segment, making the 2019 Fit a smart buy for drivers who want added peace of mind. There's a new optional audio system with Android Auto and Apple CarPlay integration, plus an all-new Fit Sport model which ratchets up the sporty flair of Honda's small hatchback. How Much Interior Space Does the 2019 Honda Fit Offer? 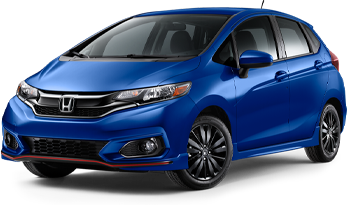 The 2019 Honda Fit hatchback's class-exclusive 2nd-Row Magic Seat® affords this small car with big versatility. Thanks to its four cargo modes, the 2019 Fit can handle a range of transport duties, including hauling tall and long items. With its 60/40 split configuration, the 2nd-Row Magic Seat allows for a mix of passenger- and cargo-hauling combinations. When all five seating positions are upright, the 2019 Fit offers 16.6 cubic feet of cargo space behind the seats; fold down the 2nd-Row Magic Seat into Utility Mode and cargo capacity expands to a maximum 52.7 cubic feet, which rivals many crossovers! The 2019 Honda Fit impresses in the subcompact car class with its available leather-trimmed seating for five passengers, plus optional heated front bucket seats and power moonroof that help keep you at the right temperature. Plus, with available paddle shifters and a built-in navigation system, you can take control of your drive and stay on-track to your next destination. With its large touchscreen display and high-power audio and infotainment system, the 2019 Fit keeps you and your passengers connected and entertained while cruising around Chicago and beyond. Enjoy your music from any device thanks to the Fit's standard Bluetooth Streaming Audio and available 6-speaker sound system. Access your phone's apps, contacts, music and more with Apple CarPlay and Android Auto integration. From its standard Multi-Angle Rearview Camera to its available Honda LaneWatch and Honda Sensing® systems, the 2019 Fit is well-equipped to alert you to traffic and obstacles around your vehicle. The available Honda Sensing suite of driver-assist technologies features four advanced systems including Adaptive Cruise Control and a Road Departure Mitigation System to keep the Fit at a safe distance from vehicles ahead, behind and on either side. With the available Honda Sensing system's Lane Keeping Assist System and Collision Mitigation Braking System, you and your 2019 Fit can stay on track and out of harm's way! The 2019 Honda Fit hatchback delivers the versatility and space you need for daily life at a price that is easy on your wallet. This agile hatchback not only boasts a fuel-sipping engine and low starting price, but high-tech and innovative cabin features, too! Visit our dealership in Highland Park, IL to discover the versatile and modern 2019 Honda Fit near Chicago!